The American Locomotive Company 4000-class 4-8-8-4 locomotive, popularly named Big Boy, is an articulated steam locomotive manufactured between 1941 and 1944 and operated by the Union Pacific Railroad in revenue service until 1959. The 25 Big Boy locomotives were built to haul freight over the Wasatch mountains between Ogden, Utah, and Green River, Wyoming. In the late 1940s, they were reassigned to Cheyenne, Wyoming, where they hauled freight over Sherman Hill to Laramie, Wyoming. They were the only locomotives to use a 4-8-8-4 wheel arrangement: four-wheel leading truck for stability entering curves, two sets of eight driving wheels and a four-wheel trailing truck to support the large firebox. According to a Union Pacific executive, the class series originally was to have been called the "Wasatch". One day while one of the engines was being built, an unknown worker scrawled "Big Boy" in chalk on its front. With that, the legendary name was born and has stuck ever since. Eight Big Boys survive. No. 4014 is being restored to operating condition after its re-acquisition by the Union Pacific Railroad. The others are preserved in various museums. In 1936, Union Pacific introduced the Challenger-type (4-6-6-4) locomotives on its main line over the Wasatch Range between Green River and Ogden. For most of the route, the maximum grade is 0.82% in either direction, but the climb eastward from Ogden, into the Wasatch Range reached 1.14%. Hauling a 3,600-short-ton (3,300 t; 3,200-long-ton) freight train demanded double heading and helper operations, and adding and removing helper engines slowed operations. To eliminate the need for double heading and helper operations, Union Pacific decided to design a new locomotive. For such a locomotive to be worthwhile, it would have to be faster and more powerful than slower locomotives like earlier compound 2-8-8-0s that UP tried after World War I. To avoid locomotive changes, the new class would need to pull long trains at a sustained speed of 60 miles per hour (100 km/h) once past mountain grades. In fact, it was designed so that it could travel smoothly and safely at 80 miles per hour (130 km/h) — even though it was not intended to be used that fast. Led by Otto Jabelmann, the head of the Research and Mechanical Standards section of the UPRR (Union Pacific Railroad) Mechanical Department, the UP design team worked with ALCO (the American Locomotive Company) to re-examine their Challenger locomotives. The team found that Union Pacific's goals could be achieved by enlarging its firebox to about 235 by 96 inches (5.97 m × 2.44 m) (about 150 sq ft or 14 m2), increasing boiler pressure to 300 psi, adding four driving wheels, and reducing the size of the driving wheels from 69 to 68 in (1,753 to 1,727 mm) on a new engine. The new locomotive was carefully designed not to exceed an axle loading of 67,800 lb, and achieved the maximum possible starting tractive effort with a factor of adhesion of 4.0. Using this research, the American Locomotive Company manufactured 25 Big Boy locomotives for Union Pacific; two groups of ten in 1941 and one group of five in 1944. The Big Boys are articulated, like the Mallet locomotive design. They were built with a wide margin of reliability and safety, and normally operated well below 60 miles per hour (100 km/h) in freight service. Peak horsepower was reached at about 41 mph (66 km/h). The maximum drawbar pull measured during 1943 tests was 138,000 lbs while starting a train. Without the tender, the Big Boy has the longest engine body of any reciprocating steam locomotive. The Big Boys were likely the heaviest steam locomotives ever built, at 1,208,750 lbs for engine and tender (772,250 lbs engine only). There is some speculation that the first series of C&O H8 2-6-6-6 engines may have weighed as much as 778,200 lbs, but during subsequent re-weighs of early-production H8s under close scrutiny by the builder and the railroad owner, all engines were found to be less than 772,250 lbs. The Big Boy locomotives had large grates to burn the low-quality bituminous coal from Union Pacific-owned mines in Wyoming. As an experiment, Locomotive 4005 was converted to burn oil; unlike a similar effort with the Challengers, it failed due to uneven heating in the Big Boy's large, single-burner firebox. Another experiment that took place for a short time was giving locomotive 4019 smoke lifters, similar to those found on locomotive 844. They were later removed, as the Big Boys' nozzle and blower were able to sufficiently blow the smoke high enough to get it out of the engineer's line of sight. Postwar increases in the price of both coal and labor and the efficiency of diesel-electric motive power foretold a limited life for the Big Boys, but they were among the last steam locomotives taken out of service. Although designed to pull 3,600 short tons (3,300 t) over the Wasatch, the Big Boys' ratings were increased several times until they were eventually rated at 4,450 short tons (4,040 t) on that line. The last revenue train hauled by a Big Boy ended its run early in the morning on July 21, 1959. Most were stored operational until 1961 and four remained in operational condition at Green River, Wyoming until 1962. Their duties were assumed by diesel locomotives and gas turbine-electric locomotives. On April 27, 1953, Locomotive 4005 was pulling a freight train through southern Wyoming when it jumped a switch track at 50 mph (80 km/h), throwing the engine onto its left side and derailing its tender and the first 18 freight cars of the 62-car train. The engineer and fireman were killed on impact; the brakeman died of severe burns in a hospital a few days later. The tender destroyed the cab of the locomotive, and the loads from the 18 derailed cars were scattered. 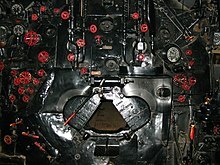 The locomotive was repaired by Union Pacific at its Cheyenne facility. 4005: Forney Transportation Museum, Denver, Colorado 39°46′37.38″N 104°58′13.8″W﻿ / ﻿39.7770500°N 104.970500°W﻿ / 39.7770500; -104.970500﻿ (Big Boy 4005) The Forney Transportation Museum in Denver moved 4005 to a renovated building in January 2001. This is the locomotive that was involved in the April 27, 1953 wreck, the only accident involving a Big Boy. 4012: Steamtown National Historic Site, Scranton, Pennsylvania 41°24′26.96″N 075°40′10.8″W﻿ / ﻿41.4074889°N 75.669667°W﻿ / 41.4074889; -75.669667﻿ (Big Boy 4012) – Built in November 1941, Union Pacific retired 4012 in 1962. 4012 was on display at Steamtown, USA in Bellows Falls, Vermont until 1984 when it was moved to Scranton, Pennsylvania 4012 is displayed outdoors since the Steamtown turntable and roundhouse are inadequate for 4012's size. The Steamtown SHS recommended that due to its good condition, No. 4012 could be feasibly restored to working order but only after determining if surrounding "track, switches, culverts, trestles, bridges, wyes, turntables and other facilities could bear her great weight". 4014: Union Pacific Railroad, Cheyenne, Wyoming 41°7′46.9308″N 104°48′49.1688″W﻿ / ﻿41.129703000°N 104.813658000°W﻿ / 41.129703000; -104.813658000﻿ (Big Boy 4014) - Reacquired by Union Pacific in 2013 and moved from its static display in Fairplex RailGiants Train Museum in Pomona, California to be restored to operational shape and in excursion service at its new home in Cheyenne, Wyoming with 3985 & 844. The locomotive is scheduled to be completed in time to participate in Union Pacific's 150 Year Golden Spike Anniversary Celebrations on May 10, 2019. 4017: National Railroad Museum, Green Bay, Wisconsin 44°29′02.70″N 088°02′55.1″W﻿ / ﻿44.4840833°N 88.048639°W﻿ / 44.4840833; -88.048639﻿ (Big Boy 4017) No. 4017 now resides in a climate-controlled shed. 4018: Museum of the American Railroad, Frisco, Texas 33°08′40″N 96°50′00″W﻿ / ﻿33.144513°N 96.833444°W﻿ / 33.144513; -96.833444﻿ (Big Boy 4018) No. 4018 was part of the museum's collection at its former location in Dallas, Texas, and was relocated by rail to the museum's new location north of Dallas in Frisco, Texas on August 25, 2013. 4023: Kenefick Park, Omaha, Nebraska 41°13′55.7″N 095°55′4.1″W﻿ / ﻿41.232139°N 95.917806°W﻿ / 41.232139; -95.917806﻿ (Big Boy 4023) Number 4023 is the only known Big Boy to move by highway since preservation, to Kenefick Park in Omaha. ^ Peck, Combes & Augur 1950, pp. 501,519,523,545. ^ a b c Elliott, Dan (April 15, 2014). "Huge Big Boy steam locomotive coming back to life". Yahoo! News. Associated Press. Retrieved April 15, 2014. ^ a b c Kratville, William (1972). Big Boy. Kratville Publications. ^ Huddleston, Eugene (December 1998). "Doctoring the Scales: The Case of the Overweight Alleghenies". Trains. Vol. 58 no. 12. pp. 78–85. ^ "DISASTER ON THE RAILS". Forney Museum of Transportation. Retrieved 16 February 2016. ^ a b c Chappell, Gordon. "Union Pacific No. 4012". Steam Over Scranton: Special History Study, American Steam Locomotives. National Park Service. Retrieved March 13, 2012. ^ "Steamtown's Locomotives and Cars". Steamtown National Historic Site. National Park Service. Retrieved March 13, 2012. Peck, C. B.; Combes, C. L.; et al., eds. (1950). 1950-52 Locomotive Cyclopedia of American Practice (Fourteenth ed.). New York: Simmons-Boardman. Wikimedia Commons has media related to Union Pacific Big Boy.